As I gaze wistfully at the beautifully decorated tree that stands proudly in my living room, the brilliant twinkling of the Christmas lights that lovingly adorn the tree seem to hypnotize me. Memories of the Christmases when all of my children were little begin to float peacefully through my mind. There’s nothing more magical than watching a child’s eyes light up with joy and appreciation when a special Christmas gift is revealed. The beautiful thing about Christmas gifts for kids is that they can be really fun to buy. I don’t know how many times I have caught my husband playing with the toys at the local superstore while I shopped, or experimenting with the kids gifts at home instead of helping me wrap them, and I have to admit, I often find myself fighting the urge to do the same thing! There is just something about purchasing Christmas gifts for kids that brings out the child in us I guess. Although shopping for kids can be really fun, it can become a challenging task as well. With all of the new toys and electronics that are available on the market these days, it’s hard to decide what to purchase. After all, we don’t want to spend big bucks on the newest or most popular gifts, only to see them sitting on a shelf gathering dust in a few weeks. If you are struggling with what gifts to buy for the kids in your life this holiday season, here are a few ideas that are certain to be a hit. Even the most simple Christmas gifts will make a big impact when they are combined with other items in a gift basket. 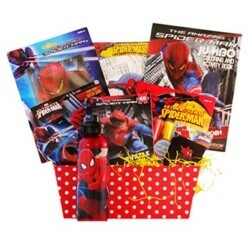 Purchase a commercially prepared gift basket like the Spiderman gift basket for boys or the Christmas Princess gift basket for girls, or purchase items based on a theme and create a unique gift basket yourself. 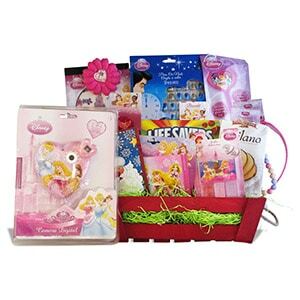 Items to consider include electronic devices and a variety of accessories, dolls and doll clothing or action figures and a play set. The tinier tots in your life will likely appreciate items that are personalized. Whether you choose a keepsake item like a personalized photo frame, a custom printed photo blanket or personalized knick knacks or wall hangings, or you choose something the little one can play with like a personalized doll, stuffed animal or a puzzle name stool, personalized gifts are certain to please. Older kids will be impressed with less childish gifts like microscopes, remote control cars, helicopters and robots or even musical instruments. Other creative gifts for the more mature children in your life include things like the dancing water speaker and light show, a headphone beanie, or even a personalized locket. 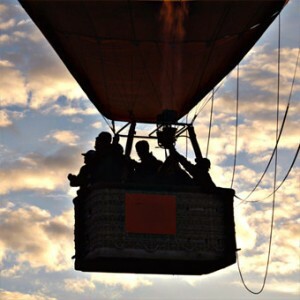 If your budget allows, consider giving an experience gift like a ride in a race car, a hot air balloon ride, or golf lessons with a pro. Less expensive ideas include tickets to a upcoming concert or event, season passes to an amusement park or zoo, or even movie tickets and a gift certificate for snacks. For additional ideas for unique Christmas gifts for kids, click around our website! With everything from stuffed animals to high tech devices, you are sure to find something special for the children in your life.